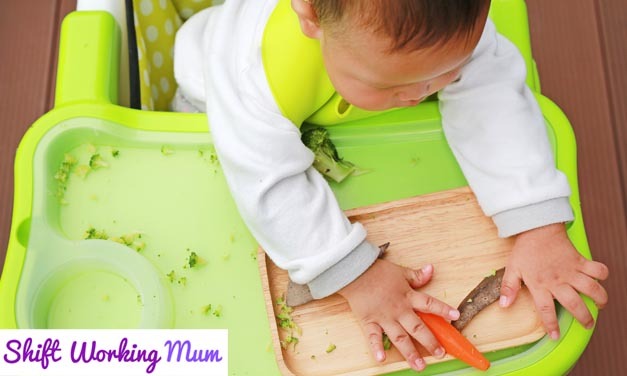 Baby led weaning is when you let baby feed themselves from the beginning when you start supplementing their diet. According to recent research most babies reach for food when they are about six months old, but some start as early as five months. 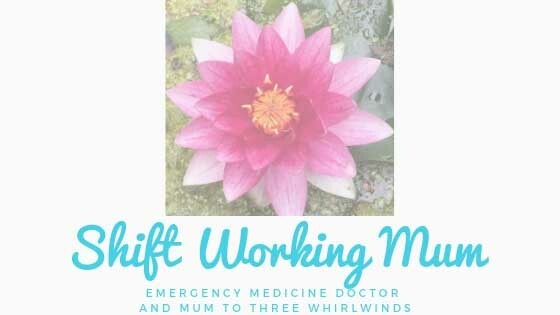 This is about the time when mums are encouraged to start feeding by their health visitor. All three of my children have started weaning at around five and a half months. Once they were capable of grabbing some of my food, I have let them have it. I have also continued to breast feed them until ten-eleven months. When you start feeding at six months your baby is developmentally ready to start feeding themselves proper food. By this age your baby has developed enough to both reach for and grab food, and are able to co-ordinate their tongue to eat it. 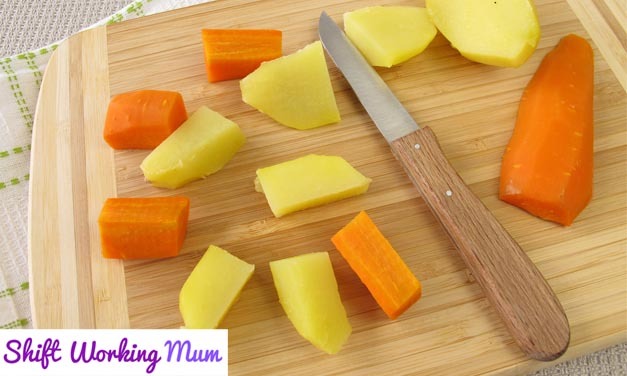 The essence of baby led weaning is that there is no need for purees, ice cube trays full of mush, food processors or baby food. They can eat exactly what you do. Just hand them the food in suitably sized chunks and let them get on with it. 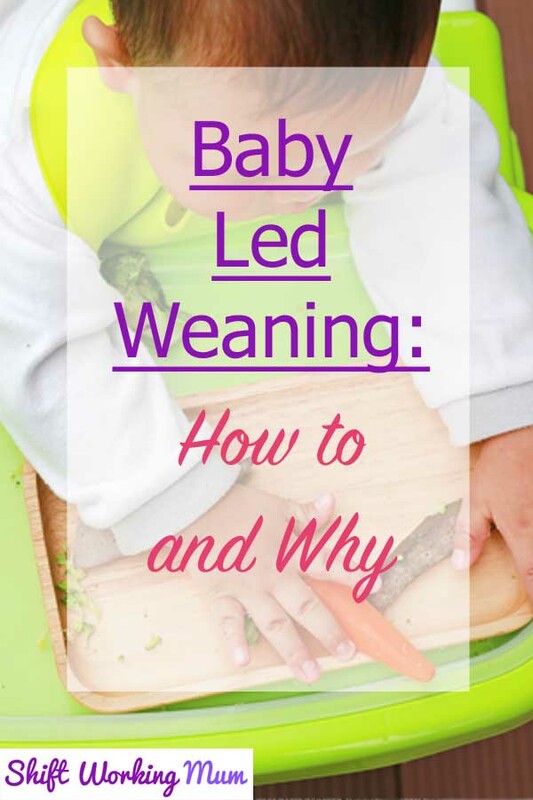 The key difference between baby led weaning and traditional weaning is the order in which your baby learns to eat. With a puree they learn to swallow first and then chew, which is OK until they encounter a lump. 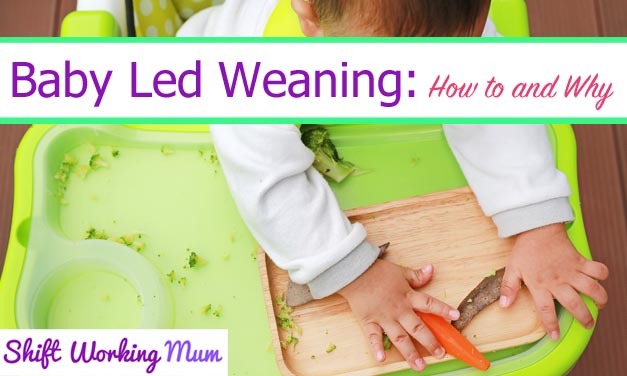 With baby led weaning your baby will learn to chew first and then swallow. Your baby is ‘leading’ the learning. As a parent you need to be able to free yourself from worries about how much they are eating and whether they like it. It is all meant to be good fun, if a little messy. Forget ‘baby food’. As long as you are not adding salt, baby can have what you have. Start off with chip-sized pieces as these are easy to hold onto, you can soon add in smaller things to develop their pincer grip. As a first food most people give cooked carrot sticks, toast fingers, cucumber sticks or cheese. There is no reason why you can’t give them some pasta bolognaise if that is what the rest of the family are having. I do recommend pasta twists rather than penne, as they have trouble sucking the penne into their mouths. Some people recommend not to have a bowl as it will just get flung across the room. I have found three bits of Blu-tack in a triangle on the bottom of the bowl helps it to stay put. There will be a lot of mess. Depending upon your floor covering, e.g. carpets, you may need a plastic sheet under the high chair. I also recommend a good sturdy high chair. I have one of these Chicco Pocket Snack Booster chairs. It has a removable tray which can go inside the dishwasher. Experience shows that the more effort you put into preparing the baby’s food, the less likely they are to eat it. It doesn’t matter if they don’t eat as they are getting enough calories from milk still. Try and eat at the same time as your baby. They will learn from you. Work up to three meals a day. Do whatever is convenient. Actual hunger can be frustrating to your baby when they are trying to learn how to eat. Try to time ‘meals’ between milk feeds. You don’t need to eat only when you are in the house, finger food can be taken out and about in a Tupperware container. Let your baby put the food into their mouth, rather than you doing it, so they can control how it moves backwards. If the baby gags then don’t worry, remember it is their way of moving food around in the mouth. Nappies will fascinate you from now on. Things sneak through the digestive system without any harm. Bananas produce poo with little black threads, Look and learn. Have a camera ready when you start letting baby feed as this period of development doesn’t last long. You can capture those toothless happy smiles when they first try something new. Personally I have a mostly Baby Led weaning approach with my kids. I also supplement them with yoghurts, weetabix and porridge, which are difficult for baby to feed themselves so I help with a spoon, but on the most part, they feed themselves.